You'reOnTime allows you to set up and sell gift vouchers. Before selling you will need to configure the types of vouchers that you sell. Scroll down to the Gift Vouchers section and click the Manage Gift Vouchers link. The Gift Voucher Search screen will appear, on the top right-hand corner is the specific menu for the screen. Click on the Add a new Gift Voucher button. 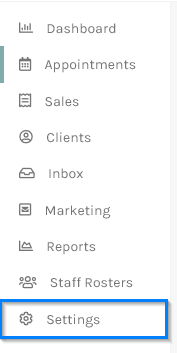 Note:This is a common theme on YoureOnTime, all the screen menus are all located on the top right-hand side and allows you to perform specific functions relating to the screen. Note: The screen is divided into sections to make navigation and use as easy as possible. Again, this is a common theme in all the screens in YoureOnTime and compulsory fields are denoted by a red star. There are two different types of gift vouchers that you can set up. Preprinted gift vouchers already have the number printed on them and will need to entered when sold; and generated vouchers that will automatically generate a code when sold. Some of the fields are specific to Gift Vouchers. The Generate Code for Voucher will determine whether the voucher is preprinted or not. 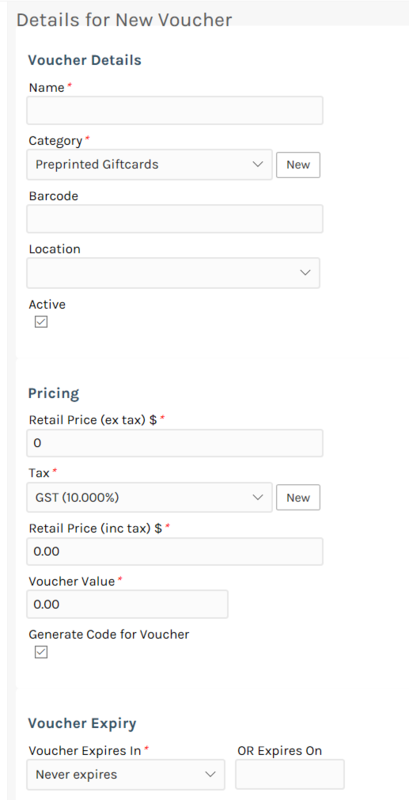 Voucher Expires In will determine if the voucher expires and if so what time period and the Voucher Value will give the voucher value which may be different to the retail price. 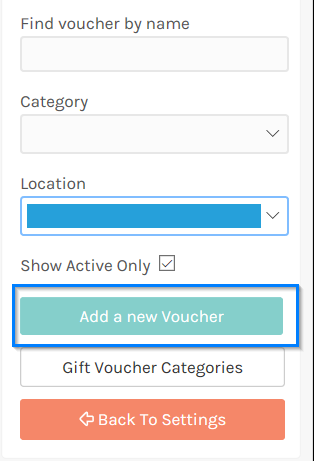 If a gift voucher Category does not exist, simply click the New link next to the Category drop-down list. This will prompt the Add New Category pop-up screen. In this example type in "Preprinted Giftcards" as the new category and click the Ok button. Click the Save button and you will be redirected back to the Gift Voucher Search screen. To modify a service, simply click on the service name in the Gift Voucher Search screen, and repeat steps 5 to 10.